After several weeks in Colombia, visiting exporters in Bogota, checking out aquarium fish habitat in Villavicencio, and exploring the country’s link to the Amazon in Leticia, it was time to move on to the next phase of my travels. Peru, a country well known for its biodiversity and boasting a robust aquarium fish trade, was my next destination. 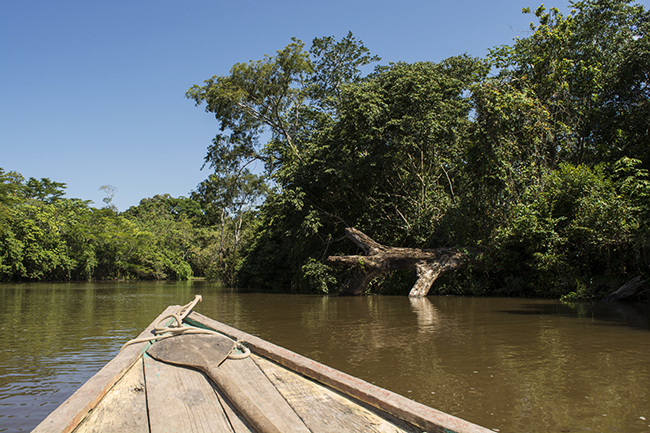 Although Peru is home to the source of the Amazon itself, it is perhaps equally well-known for the numerous tributaries, each with their own unique cohorts of fish species and variants. My first stop in Peru was the small town of Pucallpa, situated directly along the banks of one of these tributaries, the Rio Ucayali. 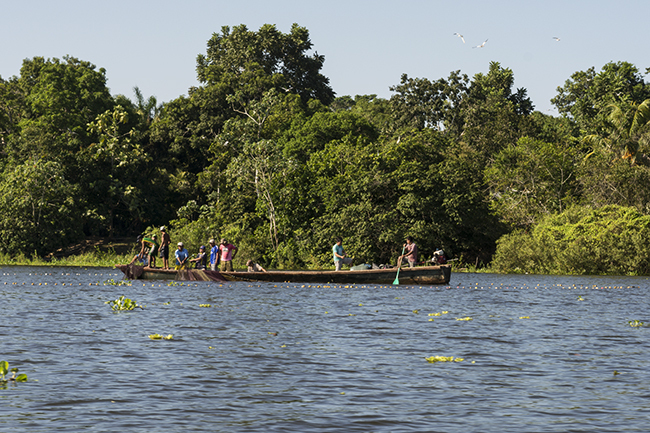 Pucallpa is also home to a small-scale aquarium fishery, and one of the collecting hubs within Peru. I was able to spend a few days in this fairly typical river town in the Amazon basin, visiting with an aquarium fish trader and exploring the Ucayali with a former aquarium fish collector who now works as a guide. The city itself is a fairly typical river town in the Amazon basin, with a bustling port area which acts as a major transit point both upstream to more rural reaches of the Ucayali, as well as downstream to Iquitos. It is positioned along a bend in the river which forms a slow-moving “lake” just north of the city known locally as Lago Yarinacocha, a fertile fishing ground for both food and aquarium fish. 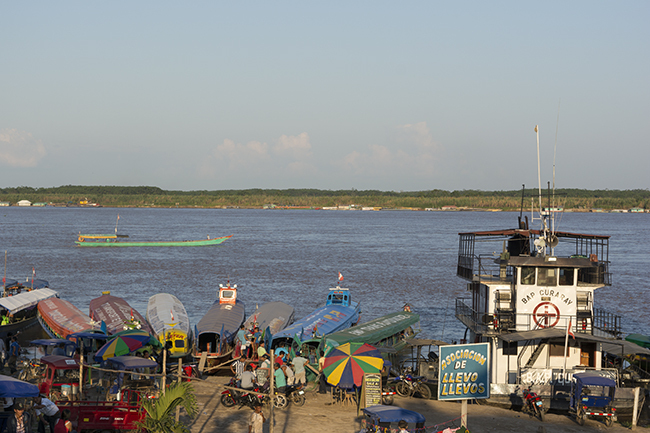 After arriving in Pucallpa’s tiny municipal airport, checking in to the hotel and taking in the hot and dusty–but somewhat charming–town, I walked down to the waterfront to get my bearings. The port area was busy with boats of all sizes loading and unloading cargoes–fruit, tires, electronics, and, of course, fish. 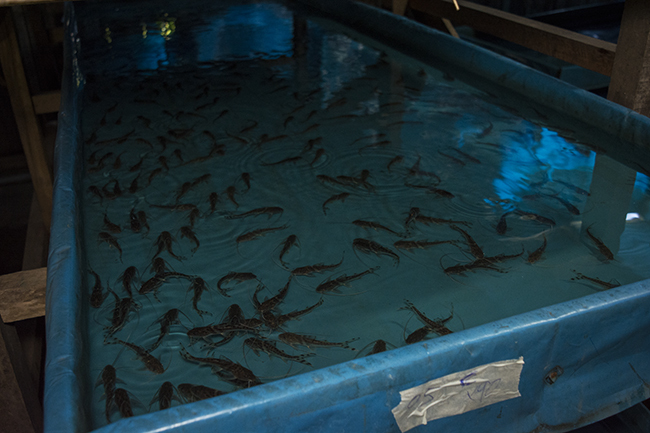 Plecos, commonly used in soup, made up the bulk of the fish coming off the boats at that time of day, but there were also a few shovelnose catfish in the mix. The following day, I had arranged to visit a local aquarium fish consolidator and shipper to learn a bit more about the aquarium trade in the area. 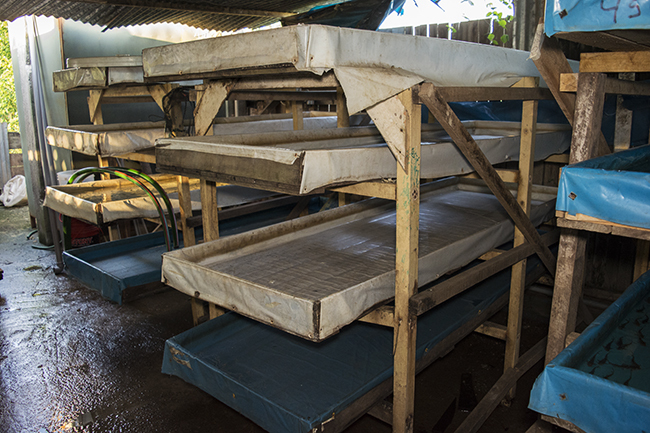 The facility was small and somewhat basic, but it had the capacity to hold a significant amount of fish. At the time of my visit, most of the holding tanks—which consisted of large, shallow wooden trays lined with thick plastic—were full of hundreds of spotted pictus (Pimelodus pictus). 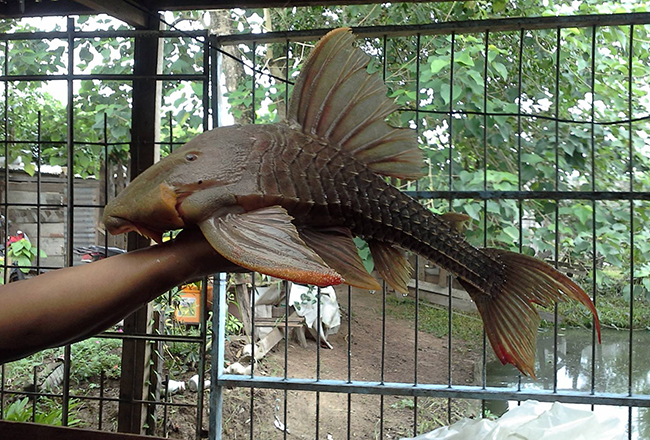 This fish is far and away the most commercially important species to the aquarium fishery on the Rio Ucayali, and some thousands pass through Pucallpa each year. The fishery for aquarium fish on the Ucayali is very small-scale, with probably no more than a dozen families in the area working full-time. 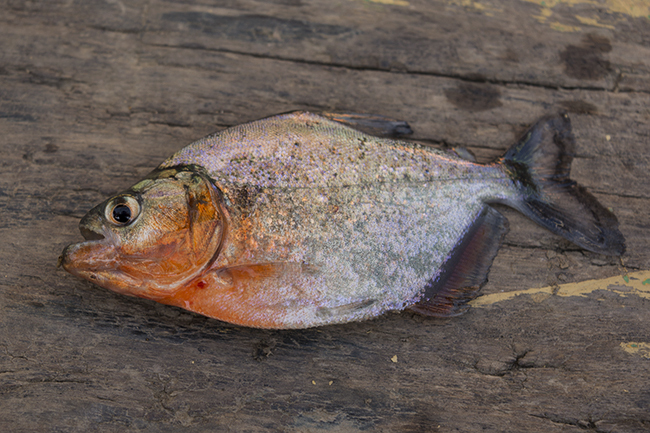 Collecting largely occurs within a day or two of Pucallpa, and species collected include various knifefish, piranhas, and the beautiful and sought-after orange, red, and green “laser” Corydoras. Several large-growing Panaque species, known locally as carachama, are also collected for the trade in the Ucayali. Many other species can certainly be found in the area, but these few species are the primary targets for aquarium fishermen and fisherwomen. Hoping to get a firsthand look at some of the other interesting fish species on the Ucayali, I arranged for the following day a fishing trip to some of the spots where aquarium fish are collected. After an early start and a long motocarro (the South American equivalent of a tuk-tuk) ride through the pitch-black town and out to the shores of the lake, I was once again out on the water searching for fish. My guide, Gilber, had worked as an aquarium fish collector for several years and was extremely knowledgeable about the local fauna, pointing out some of the favored spots of arowana, oscar, and others. 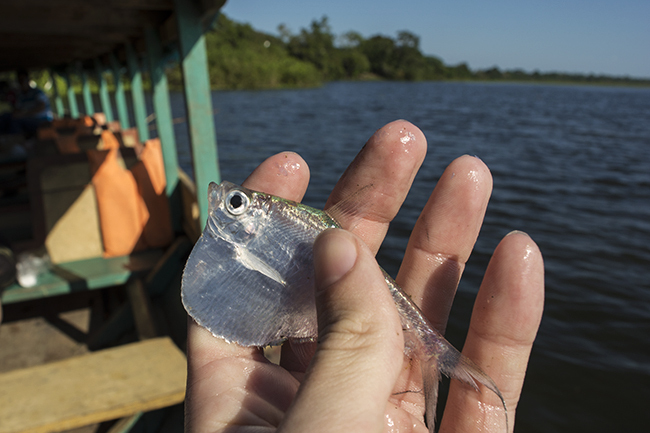 With a variety of different nets, we collected red-bellied piranha (Pygocentrus nattereri), Anostomus, Lima Shovelnose (Sorubimichthys lima), and Semaprochilodus sp. Unfortunately, the local water levels were too high for most Corydoras sp., but some interesting characins more than made up for it. In particular, a giant silver hatchetfish species (likely Thoracocharax sp.) was a unique find that probably deserves to be more widely available in the hobby. Later that day, we came across a small fishing boat and stopped to observe as they pulled in a large net. 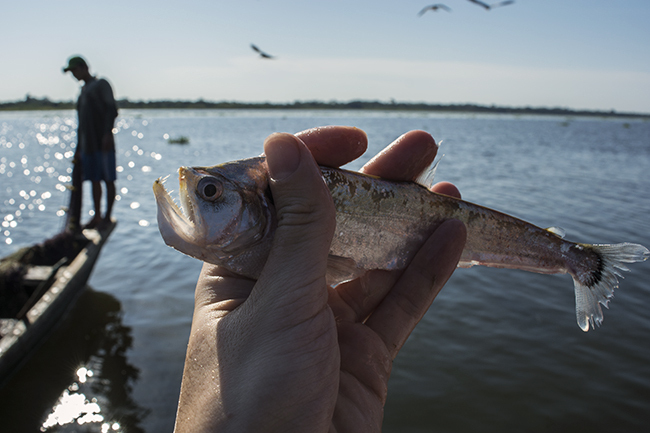 Huge numbers of corvina, the freshwater grunt common throughout the region, made up the bulk of the catch. Many fearsome-looking payara, also known as vampire characins, were also in the catch, as well as a very elongated Rhaphiodon sp. 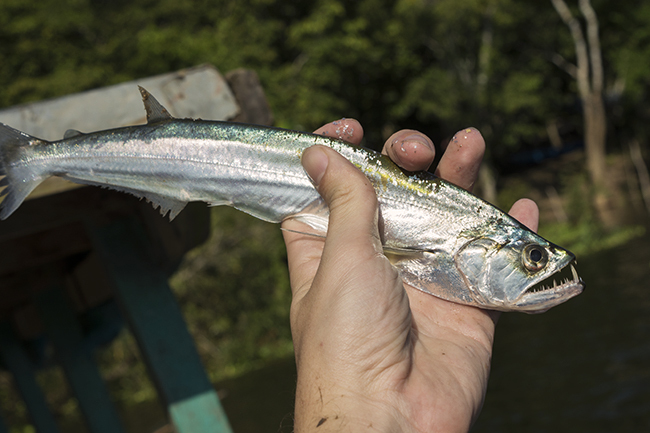 It was interesting to find these in a slow moving, blackwater lake—far from their typical rapid, whitewater habitat—but almost every haul of the net revealed more. Later in the day, we moved out to the Ucayali itself for a short and uneventful trip upriver before the setting sun indicated it was time to turn back. Although brief, the short side trip to Pucallpa was fascinating, and had me looking forward to a much longer stay in Iquitos, where I hoped to do much of the same. The aquarium fishery on the Ucayali is small, and relatively few fish make their way into the trade and hobby from this region, but I would venture to guess that some interesting fish still await discovery in the area. Great posts Mike. Love your adventures.